Alcohol dependence develops when the body adapts to the presence of alcohol. 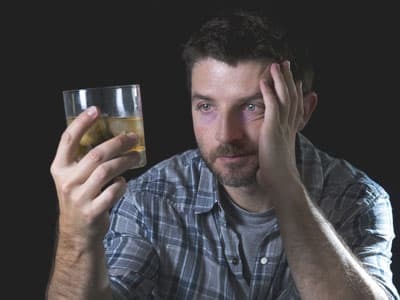 Someone who is dependent on alcohol will often experience withdrawal symptoms when he or she stops drinking. These symptoms can be life-threatening and may require medical monitoring. Who Answers? to find an alcohol detox center near you. A treatment support advisor can help you locate a program based on your insurance. How long someone was drinking. How much he or she used. Whether he or she has any mental health or medical conditions. Whether the person has gone through withdrawal before. Delirium tremens may occur after prolonged, problematic alcohol use. Sensitivity to touch, light, and sound. Deep and long sleep (for a day or longer). Seizures (which are most common in the first 12 to 48 hours and with those who have a history of complications with alcohol withdrawal). Other complications may occur from injuries associated with the development of withdrawal symptoms (e.g., a head injury due to a fall from an alcohol withdrawal seizure). Delirium tremens and any seizure activity can be fatal.1,4 If you suspect you or someone you know is experiencing this form of withdrawal, seek medical attention immediately. Severe symptoms generally occur in those who have consumed alcohol for long periods of time in large amounts. Difficulty with mental tasks, such as learning, problem-solving, or memory. 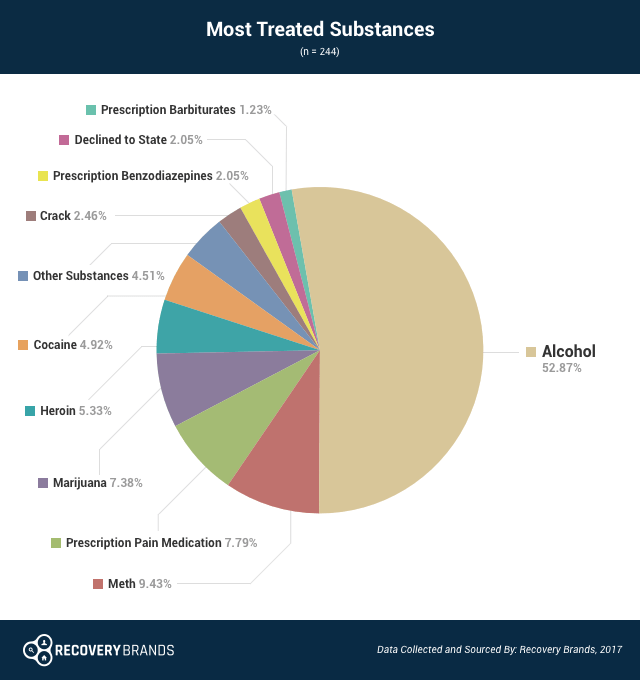 Ethanol, or alcohol, is abused at a higher rate than any other drug among those engaged in treatment, a 2017 Recovery Brands survey found. The survey reports that nearly 70% of respondents went to treatment because of an alcohol problem, and a shocking 52.87% of people that responded received the most treatment for alcohol abuse. Who Answers? to get help with recovery and find the best program to fit your needs. Alcohol withdrawal may occur after periods of heavy alcohol abuse. Alcohol is a depressant. It interacts with special receptor complexes in the brain known as gamma-aminobutyric acid (GABA) receptors. At the receptor level, alcohol effectively mimics the effects of GABA, an inhibitory neurotransmitter, causing a decrease in central nervous system excitability. Long-term use of alcohol can actually decrease the number of these GABA receptors, resulting in less of an inhibitory effect when consumed. When this occurs, more and more alcohol is required to achieve the same effect.2 This phenomenon is known as tolerance. Who Answers? to learn about detox programs. Detox center. A detox center provides support during the withdrawal period. These facilities offer medical supervision and care to ensure a safe and comfortable detox. People may transition to an inpatient or outpatient program after completing treatment at a detox center. Inpatient treatment. Inpatient rehab programs may offer detox or require that the person complete detox elsewhere before coming to the facility. Inpatient treatment includes group and individual therapy, addiction education, recreational activities, and aftercare planning. Treatment can last from 28 days to 90 days or more. Outpatient treatment. Outpatient rehab programs may offer detox to people whose withdrawal symptoms are relatively less severe. Participants do not live at the facility, and treatment usually includes group therapy, though some programs may incorporate individual counseling as well. Partial hospitalization. Partial hospitalization is a type of outpatient program where participants attend treatment a certain number of days each week for several hours a day. Like other outpatient programs, these programs may follow a person at low risk of severe withdrawal through the detox period. Participants are assessed and given an individualized treatment plan based on their needs. Treatment often includes medical management, individual therapy, group counseling, and aftercare planning. Once a person completes detox, he or she should participate in some type of continuing inpatient or outpatient treatment program to help maintain abstinence and prevent relapse. Support groups such as Alcoholics Anonymous (AA), Narcotics Anonymous (NA), and SMART Recovery are also available for ongoing support. The most common medications used to manage the alcohol withdrawal syndrome are benzodiazepines,2,3 a class of sedatives that have a similar mechanism of action to alcohol. Benzos decrease the risk of severe symptoms, such as delirium tremens or seizures. After a few days, the person is gradually tapered off the medication.2 A physician should administer and supervise the use of medications. Anticonvulsants – standard anti-epileptic medications, such as carbamazepine (Tegretol), that can help to control severe seizures. Beta blockers – may be used to treat high blood pressure and rapid heart rate. If you need help determining which type of withdrawal treatment is right for you, call 1-888-319-2606 Who Answers? to speak with a treatment support specialist about detox options.
. Bayard, M., Mcintyre, J., Hill, K.R., Woodside, J. Alcohol Withdrawal Syndrome. American Family Physician 69 (6), 1443-1450.
. MedlinePlus (2016). Delirium Tremens.
. George, A. and Figueredo, V. (2010). Alcohol and Arrhythmias: A Comprehensive Review. Journal of Cardiovascular Medicine; 11(4): 221-228.
. Ricks, J., Replogle, W., and Cook, N. (2010). Management of Alcohol Withdrawal Syndrome. American Family Physician 82(4): 344-347.
. Substance Abuse and Mental Health Services Administration (2016). Substance Use Disorder Treatment Providers and CCBHCs.
. UCLA Dual Diagnosis Program. (2016). Post-Acute Withdrawal Syndrome (PAWS).